When I first heard about the runaway Wisconsin legislators some days ago, I thought to myself, They went to Rockford? Why not Chicago? They could have at least seen a show. Far be it from me to take a serious political matter seriously when Im huffing and puffing my way through a torturous workout on the treadmill. But lets not be glib any longer. The situation is serious with Wisconsin politics, and should be seen not as a fluke, but as the potential starting point of a series of rancorous class-inflected debates, and what Randi Weingarten, president of the American Federation of Teachers, discussed as the fight for dignity in one's earnings in the workplace, on the Colbert Report this week. The proposed cuts lobbed at public employees this is anywhere from snowplow operators (VIPs in the Midwest, lemme tell you), to city workers of all kinds, and to teachers, among others threaten the core of the various unions representing workers of all income ranges, colors, and occupations: the right to collective bargaining. Wisconsin governor Scott Walker ignited a firestorm that has begun to spread through the prairies of the Midwest; it is not only Wis. Dems who took for the hills to temporarily thwart a referendum on the bill. Indiana Dems are currently hiding out in central Illinois (my little state certainly seems to be a popular place to go on the lam.) avoiding a vote on their union issues, and as some Indiana Republicans have said, are being very anti-democratic about it. It looks like Ohio Dems will be forced to make a choice on the matter in the near future, as well. The only reason why Ohio Dems wouldn't be able to take their Astro Minivans across state borders is because Republicans have enough votes without Dems for a quorum - still, thousands of protestors descended upon Columbus, just like in the capitals in Indianapolis and Madison. 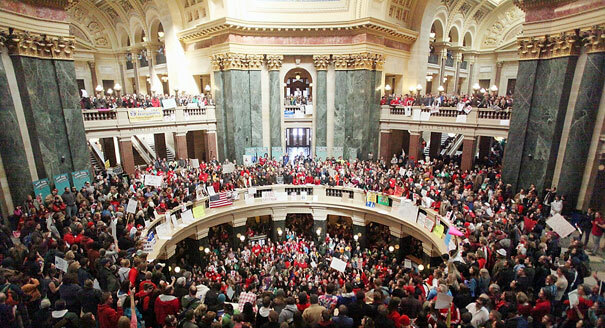 Thousands of people gathered in the Rotunda at the state capital building in Madison, Wisconsin, and many more traveled across state lines to lend their support. There also were counter-protests which shouldnt be overlooked, either. Both sets of protesters added to a critical mass of people organizing, chanting, sitting in, marching, yelling, picketing, tweeting, facebooking, and blogging for their rights. As I live in walking-distance proximity to Chicago, I couldnt help but compare the excitement and excitability of these various protests to the lackluster voter turnout in the Chicago Mayoral race last night. Not even five candidates: Rahm Emanuel (victor); Gery Chico; Miguel Del Valle; Carol Moseley-Braun; and Patricia Van Pelt-Watkins, could bring more than 45% of the voting populace to the polls. Some blamed the cold weather for the low turnout, but come on, this is Chicago. People were getting a last workout in by jogging around the neighborhood when the blizzard hit two weeks ago. Still others myself included suited up and went outside to see what a real blizzard looked like, until the biting wind and flying ice drove us inside. More than likely, a confluence of factors, with apathy or weariness of the Chicago Way (with cronyism and corruptness being two oft used buzz words) kept folks away. But the political fights going on across the Midwest as they relate to unions show the importance of taking an interest in politics, of speaking up for oneself and demanding that lawmakers take notice of the people they are meant to represent. The debates about the role and place for unions will no doubt darken Illinois doorstep in the coming months, if not weeks. Illinois and Chicago, in particular is suffering from monumental debt, and state employees pensions and benefits are at the center of the debate. The current protests as well as the somewhat farcical scene of Democrats from other states driving across the Illinois border to avoid quorum votes, for now, remind us what is at stake when we choose not to make a choice. I tip my hat to the scores of people who have demonstrated the power of collective engagement.